We’d love your help. Let us know what’s wrong with this preview of The Case for the Real Jesus by Lee Strobel. To ask other readers questions about The Case for the Real Jesus, please sign up. 1. Scholars are uncovering a radically different Jesu Fantastic book! I thoroughly enjoyed this book by Lee Strobel. I like his investigative journalist approach to topics, with solid reasons and sound logic. In this book, Lee sets out to investigate the claims about Jesus by critics and skeptics. Is what the church teaches about Jesus reasonable? Or has it all been proven false by modern scholarship? How can we know the REAL Jesus? Lee tackles six challenges to the church’s teaching about Jesus. I really enjoyed this book. In a world based on media, it can be difficult at times to determine what is true and what is false. Anyone with a computer and internet access can publish whatever they want on the World Wide Web. Strobel's skeptical journalist background gives him the edge he needs to get answers from the experts on matters of faith. I would recommend this apologetics book to anyone who is questioning the faith or just wants to know how to address attacks on faith. Are scholars uncov I really enjoyed this book. In a world based on media, it can be difficult at times to determine what is true and what is false. Anyone with a computer and internet access can publish whatever they want on the World Wide Web. Strobel's skeptical journalist background gives him the edge he needs to get answers from the experts on matters of faith. I would recommend this apologetics book to anyone who is questioning the faith or just wants to know how to address attacks on faith. Are scholars uncovering a "new" Jesus in suppressed ancient documents, just as credible as the four gospels? Did the Church tamper with the Bible texts to get them to say what they wanted about Jesus? Have new explanations refuted the Christian idea of a resurrected Christ? Were Christianity's beliefs borrowed from pagan religions? Was Jesus an impostor who failed to fulfill Messianic prohecies? Should we be free to "pick and choose" what to believe about Jesus? This book is clear, consice, and very well written. My only complaint is that Strobel, who is a Christian, plays the role of the sole skeptic. Because of this, it can be claimed that Strobel is stacking the deck in favor of faith. I do not see this. He demands the facts- asking hard and pointed questions of the experts. But it would still be nice if he would give an expert from the other side an opportunity for rebuttal. Strobel's book—among other things—is a rebuttal to Dr. Ehrman's work, "Misquoting Jesus." Strobel does an admirable job for Christians who fear the faith rug has been pulled out from under them. Strobel helps you to stand and to stand up straight. A must read if you are at all familiar with Dr. Ehrman's works. It is only a fair look at both sides. I found this book to be challenging. Not because it was over my head, but because it required critical thinking about some topics that have been in recent news. Many attacks about the validity of the Canon of Scripture as we know it have been in the news. Some claim to have found another Gospel book, others found evidence for something to contradict the Bible. The list goes on. The attacks where not necessarily on the Bible, but on Jesus Himself. Was He really who He said He was or is there evid I found this book to be challenging. Not because it was over my head, but because it required critical thinking about some topics that have been in recent news. Many attacks about the validity of the Canon of Scripture as we know it have been in the news. Some claim to have found another Gospel book, others found evidence for something to contradict the Bible. The list goes on. The attacks where not necessarily on the Bible, but on Jesus Himself. Was He really who He said He was or is there evidence out there contradicting what is stated in the Canon of Scripture? Mr. Strobel went through and tackled the 6 most difficult to answer allegations/claims to see if the real Jesus was accurately presented in the current Canon of Scripture or if these alternative books have validity. Groups like the Jesus Seminar who claim to have scholars determining if Jesus really said something in the Bible. One of the recurring themes in this book is that many so-called "scholars" are not really scholars at all. In an age of easy data access through the internet, anyone can claim to be an expert about a subject. But reading Wikipedia and blogs does not qualify you as a scholar. Strobel, an investigative journalist, went to the top scholars in their fields to ask if these claims (i.e. the gospel of Thomas, the Jesus Papers, the secret gospel of Mark, etc.) had credibility or not. Remarkably, many of the scholars claiming these books as valid had very shaky credentials, some could not even read/write the original languages that these manuscripts were written in, and one, through very compelling evidence, is believed to have been a complete forgery. A majority of these other books are claimed to have been written during the time of Jesus (so that they gain credibility); however, in each case they are found to not have been written until at least the second century which is heavily influenced by a false religion called Gnosticism. Through a series of examinations, the facts about each book and their credibility are found wanting. Lee Strobel has written several "The Case for..." books. 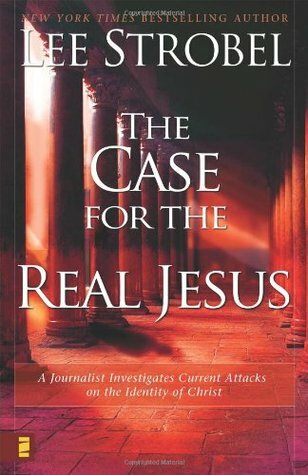 The Case for the Real Jesus: A Journalist Investigates Current Attacks on the Identity of Christ explicitly counters the arguments from many different sources that question Jesus, the teachings about him and the integrity of the New Testament. Critics argue that Strobel is not an expert on the things he writes about. I believe he would agree with that - at most he is a well-informed layman. But, Strobel did the best thing that one can do to create a rebuttal these arguments - he went out to the experts and questioned them (because, really, who is a qualified expert in all of these fields?). Strobel asks them the questions that the "anti-" crowd would ask (really a wide range, from Muslim teachers to Hollywood directors to college professors to former Christian clergy to internet bloggers). My faith has never really swayed in the past and I have always been a Christian and believer. This book (audio) only strengthens my belief in Jesus and Christianity as a religion. Strobel's interviews with the leading historical and Biblical leaders denounce any non sense books, claims, etc from the left wing crazy liberals and radicals that have been popping up lately stating that Jesus was not the Son of God, the New Testament is made up, other Gospels have been out there, but edited out and o My faith has never really swayed in the past and I have always been a Christian and believer. This book (audio) only strengthens my belief in Jesus and Christianity as a religion. Strobel's interviews with the leading historical and Biblical leaders denounce any non sense books, claims, etc from the left wing crazy liberals and radicals that have been popping up lately stating that Jesus was not the Son of God, the New Testament is made up, other Gospels have been out there, but edited out and other fictitious claims. 2. The Bible's portrait of Jesus can't be trusted. 3. New explanations have refuted Jesus' resurrection. 4. Christianity's beliefs about Jesus were copied from pagan religions. There's a lot of confusion today regarding "alternative" gospels. The popular view is that the prevailing version Orthodox Christianity is one of the existing 2 or 3rd century forms that prevailed. Another revisionist attempt at invalidating the historical Jesus. This is ammunition that every Christian needs (whether Catholic, Protestant, Evangelical, Orthodox, Pentecostal, etc.) Get this and read it. Then share it. Stobel dives into the nitty-gritty of the Bible and historical evidence for Jesus in this one. It's a good resource for those who want to know even more about evidence within Christianity. But more often than not he gets lost in the minute details, which makes for some pretty dry prose. Just read The Case for Christ instead. I wanted to read an Easter-related book since this Sunday marks the holiday that is the central tenet on which all of Christianity stands or falls. Christianaudio.com gave this out as a free audio download in March, and I found it to be a great refresher on where scholarship currently stands on the resurrection, the reliability of the Bible, and the identity of Jesus. Strobel simply puts his interviews into print, mostly verbatim, so it's not really like reading a book or an article. You sort of I wanted to read an Easter-related book since this Sunday marks the holiday that is the central tenet on which all of Christianity stands or falls. Christianaudio.com gave this out as a free audio download in March, and I found it to be a great refresher on where scholarship currently stands on the resurrection, the reliability of the Bible, and the identity of Jesus. Strobel simply puts his interviews into print, mostly verbatim, so it's not really like reading a book or an article. You sort of get the full firehose from the interviewee, although Strobel probably edits it for brevity and content. Valid criticisms of this book are that Strobel doesn't interview Bart Ehrman, John Dominic Crossan, and other skeptics whose claims he is investigating. He is also a professing Christian who asks questions he hears from skeptics or that he thinks skeptics would ask, but it comes across as not authentically questioning (Strobel chronicled his own investigations that led him from atheism to Christianity in The Case for Christ). Strobel tries to come across in his interviews as naive or unaware, but he would have already encountered much of the information while writing The Case for Christ and The Case for Faith. (Note: I've read both but it's been years ago.) I don't know that Strobel lobs "softballs," but he's often asking questions he already knows their answer to. There are plenty of Bible difficulties that are not addressed. It's not clear exactly how Strobel chose his sources, but their CVs speak for themselves. You are essentially getting summaries of their books, which they sometimes pick up and quote from, in this book. That's a good value of this book, it leads you to read a lot of other sources. To the critics, I would say that watch the interviewees debate the skeptics yourself, often found on YouTube. It would make no sense for Strobel to be a go-between on the arguments. He's essentially doing that from the critics' written works and interviews. There's no getting around his bias, but no one on the other side seems to be willing to take the time to interview the same scholars. My criticism are the details that Strobel puts in about the interviews themselves, what they're eating, drinking, the clothes they're wearing. I guess trying to bring the reader into the office with him, but it's a bit amateurish in nature. Craig A. Evans is generally respected by conservatives and liberals and is Strobel's first interview. "Fact: The Gospel of Thomas is late, not early; secondary, not authentic. Contrary to what a few scholars maintain, the Gospel of Thomas originated in Syria and probably no earlier than the end of the second century. The Gospel of Peter, which describes a talking cross, is late and incredible. In fact, the fragmentary document that we have may not be the Gospel of Peter at all. The document that we have may date to the fourth or fifth century. The 'secret' version of the Gospel of Mark, allegedly found in the Mar Saba Monastery, is a modern hoax. Analysis of the hand-writing betrays the tell-tale signs of forgery. The distinctive conclusions of the Jesus Seminar are rejected by most scholars in North America and Europe. There is absolutely no credible evidence that Jesus had a wife or a child. The evidence is compelling that the New Testament Gospels--Matthew, Mark, Luke, and John--are our best sources for understanding the historical Jesus. The New Testament Gospels are based on eyewitness testimony and truthfully and accurately describe the teaching, life, and death of Jesus. Jesus was not a Cynic; in all probability he never encountered a Cynic. No killer monks (albino or otherwise) number among the membership of Opus Dei." Evans notes that the Jesus seminar and 19th century biblical critics were weak on Hebrew, interpreting Jesus improperly into Greco-Roman thought. They take "Jesus out of (his Hebrew) context," and make him fit into a mold not given by anything actually recorded. New ideas get headlines, but confirmation of old ideas do not, which is why the Jesus Seminar are often chosen when PBS or other make a documentary. John Dominic Crossan is "on his own" maintaining certain positions on the gnostic texts that no other scholars take. Evans examines each of the Gnostic "gospels," demonstrating their authors' clear infamiliarity with burial practices and other Jewish customs. The Gospel of Thomas appears to be quoting from Tatian's Diatessaron-- the first harmony of the four gospels-- giving it a much later date than what the Jesus Seminar claims. Its Syriac translation appears to be a second century biblical memorization aid. The "Gospel of Mary" likely dates to 150-200 a.d. The Gospel of Judas was also late and already mentioned as false by Irenaous early in the second century. Throughout the book, the interviewees often act astonished or become quite "animated" or "emphatic," saying words like "ridiculous," or "completely false," etc. As Evans sets out to demolish Erhman's ideas, you're not left with much else than sympathy for Erhman. He walks through an exercise in biblical translation that he does with his students. The differences in the manuscripts don't affect meaning. There is often one letter difference, a mispelling in Greek. He discusses several known scribal errors, and debates the significance of a few. (Aside: Ehrman and Gordon Fee both hold that scribal editions in 1 Corinthians has affected the church's hermeneutic of the epistle in relation to women and authority.) The fact that we can identify those discrepancies is important when getting the original idea. "Ehrman didn't prove that any doctrine is jeopardized." The Dan Brown Da Vinci Code-inspired conspiracy theories that Diocletian destroyed manuscripts is false, we have much earlier ones. Textual criticism is "tedium" because researchers rarely find any notable differences between the thousands of documents. "I think the church got it right" (at Nicea and since). Another interesting factoid, the earliest manuscript of Revelation (from 3rd century?) has the number of the beast as 616, as do a number of other manuscripts. Bruce Metzger is one New Testament expert who is respected by Ehrman. Strobel interviewed him in The Case for Christ, where he said that "scholarship has built my faith." But Strobel writes this book to look at updated and more popular objections to the resurrection since Case for Christ was published. This brings him to Mike Licona, who wrote his dissertation on the resurrection, wrote Paul Meets Muhammad, co-authored The Case for the Resurrection with Gary Habermas, and has debated Muslim scholars. 1. Everyone largely agrees that Jesus was crucified. Even Crossan and various skeptics attest this is not problematic. 2. Early tradition agrees on the account. The earliest manuscripts we have from Paul's epistles to the gospels agree on the death and resurrection of Jesus, and what came before and after. 3. The conversion of Paul, a former enemy of Christians. The Reza Aslan and J.S. Spong books I've read both have a hard time discounting Paul's conversion. It's clear he believed what he believed quite strongly. 4. James' conversion. James' and Jesus' other siblings are documented as not believing he was the messiah when Jesus was alive. Licona admits that this point is troubling even for himself. How would the brother of Jesus not have heard of the virgin birth from his mother? But as William Lane Craig has pointed out, if your brother claimed to be divine, what would he have to do to convince you? You know him, after all. Probably be raised from the dead. The earliest creeds we have says Jesus appeared to James after his resurrection, then to many others. We know that James later believed because he is recorded as a leader of the church in Jerusalem and was later martyred for his belief that Jesus was the Christ. 5. Jesus tomb is empty. "75% of scholars agree on this." No body was produced by the Romans or the Jews. Licona walks Strobel through the various scenarios put forth, including the "healing" hypothesis, the fake Jesus on the cross that the Koran purports (Licona points out that if this were true it would make Allah a deceiver), and others that have already been covered by Evans above. Licona addresses the Koran, Michael Baigent's The Jesus Papers, and other works. It's clear that he has gained a lot of inspiration from Gary Habermas as well. Strobel then considers the more popular claims that a God who lives on earth, dies, and is resurrected is simply plagiarism from Greco-Roman, Zoroastrian, and other regional sources available to the Gospel authors. Is the Bible simply plagiarism of myths? Bruce Metzger did research decades ago debunking much of what seems to be regurgitated today. Strobel interviews Edwin Yamauchi who is an expert on Gnostic texts, near eastern languages, and mythology. He asks specifically about whether the Mithras legend could have contributed to a Jesus myth. Yamauchi contends that Mithraism appears too late in the region to have contributed to the Gospel authors, or to be part of some secret underground religion. It is more probable that the opposite happened-- the Gospels influenced the Mithras legends, as similarities appear to have been developed in 1st-4th centuries AD. Yamauchi points to research that debunked these theories long ago. If the Gospels are reasonably accurate and Jesus was most likely resurrected, then why don't Jews widely accept him? Strobel probes Dr. Michael Brown, of "Jews for Jesus," for his answers. Brown walks through the Old Testament prophecies of the Messiah and how they could be fulfilled by Jesus. Strobel presents various objections by modern rabbis-- the Messiah could not have been divine, was supposed to usher in the eternal earthly kingdom, etc. and Brown refutes them like Jewish Christians have been doing since the resurrection. Brown further purports that the messiah had to fulfill prophecies before the second temple was destroyed by the Romans, and Jesus is the only one that did so. He has the highest probability of being one to fulfil the prophecies. Now that the second temple is destroyed, it's not possible for there to be another. Brown walks through the "suffering servant" of Isaiah passages in a neat way and explains the difficulties of Old Testament exegesis. Whole volumes have been written on the problematic nature of OT use in the NT. The last interview is with Paul Copan, author of True for You, But Not for Me. Copan is arguing against postmodernism. He defines truth as "a belief that matches up with reality." Certain truths are absolute and knowable. He discusses the important of getting a postmodern skeptic to accept reason before one can argue from historical evidences and such. Strobel's conclusion recaps the major points of the interviews and contains a compendium of quotes by experts on Dead Sea scrolls, Eastern religions, etc. Larry W. Hurtado, Richard Baucum, C.S. Lewis, and more. Lewis wrote that Christianity is difficult to accept because it requires us to "Hand over the whole natural self..." Surrender is scary. Our modern culture and groups like the Jesus Seminar try to make Jesus our equal, which we would prefer to have instead of someone we need to actually submit to and rely on for eternal life. Sin, likewise, is something we'd rather delete-- along with hell. Once you accept the evidence suggesting the resurrection is true, it requires you change your life. To be clear, I am a Christian whose primary concern is history. I am not concerned by claims that historians make or threatened by provocative questions, I am simply looking for answers in history that make the most real-world sense. By contrast, Strobel is a Christian journalist and author who is defending Christian beliefs that appear to be threatened by historical claims. In proper journalistic fashion, he seeks to refute popular claims that appear to undermine belief in Jesus as we currently To be clear, I am a Christian whose primary concern is history. I am not concerned by claims that historians make or threatened by provocative questions, I am simply looking for answers in history that make the most real-world sense. By contrast, Strobel is a Christian journalist and author who is defending Christian beliefs that appear to be threatened by historical claims. In proper journalistic fashion, he seeks to refute popular claims that appear to undermine belief in Jesus as we currently see it. This book asks some relevant questions about Jesus in history and is accessible to any reader interested, but it is not the consideration in depth or scope that I am looking for. Strobel says he tried to enter the debate as open mindedly as he did in “Case for Christ,” as an atheist, but the focus of the book is using Christian scholars to refute the claims against Christianity made by both good historians and those with an ax to grind. This will be mistaken as the definitive answer for the historical questions of Jesus. It is most definitely not. This book is narrated in Strobel’s usual, interview style, which is an effective approach given the antagonistic nature of the content. He presents his questions and motivations clearly, he finds credible experts in the field of New Testament studies, and researches opposing viewpoints that represent what he feels are the main dissenting viewpoints against belief in a historically viable Jesus. Each expert is given a thorough CV, a brief bio, and an opportunity to lay the foundation for the current section’s topic. Strobel makes sure it includes how and why they believe Jesus is historically viable and why our current belief system makes sense. Strobel then cross-examines them as a prosecuting attorney would do (or in his case as the legal editor of the Chicago Tribune) by attacking their main points with quotes and references from other scholars. Each scholar is then given as long as necessary to revitalize their major points by answering or refuting Strobel’s concerns. In all, it is an effective strategy. Several of the points made are timely, accurate, and useful. One such is the disparity between Dr. Bart Ehrman’s opinions that the errors in the New Testament manuscript documents make the text unreliable to its core vs. the low probable impact many of these differences probably have. 1)	He never interviews a non-believer, let alone a person who openly opposes Christianity. All arguments for the viability of Jesus in history and subsequent Christianity are made by believers. Everyone has bias, even people who are truly trying to be “objective” or “open minded” about the data presented. This is the same reason historians approach the Gospel narratives with caution – even though they are clearly the best sources of information we have about Jesus himself. The Gospels were written by believers, Christians, who want others to understand why he is the messiah, among other things. It does not discredit them, but it makes them less overtly reliable about Jesus’ messianic claims than another writing that does not promote Jesus as messiah. Each of these historians wants Jesus, and what is written about Jesus, to be true. This does not discredit them, but it does lessen their “objectivity." Strobel himself points out that using the “attestation of enemies” is a very powerful source of reliability when making the same point. Strobel does include tidbits about the agreement of skeptics but only through the Christian scholar, and only when it supports the claims of our current view of Christianity. 2)	In many cases – the interview with Dr. Edwin Yamauchi being the most pronounced – when Strobel asks a question that conflicts with a point just made, the answer is often, “no, that isn’t true.” No further questioning, cross-examination, or clarification. Just . . . “no? !” I found these segments particularly unsatisfying because of point #1, because we are simply relying on the judgment of the scholar and not the cogency of his reasoning related to the facts involved, and because the lack of detail makes it difficult to follow up afterward to research the point on my own. I am left with a felt need to go and buy Yamauchi’s books to try and understand, rather than having the means readily available here. Yet another thing I don’t have time to do. 3)	The book centers itself on the current beliefs of and attacks against Christianity. It does not question some of the more foundational considerations, such as the fact our versions of evangelical, protestant, catholic, or Pentecostal beliefs may not reflect the 1st century understandings of what Jesus meant by what he said in the gospels. Also, little allowance is made for the validity of certain claims against Christianity, such as the need for caution when approaching the New Testament with certain assumptions about chronology or our desire for the bible to be inerrant, infallible and authoritative in all aspects of the universe. Maybe Dr. Ehrman’s professor was right, Mark just got it wrong. The bible was never meant to be held up to an empirical microscope – as was attempted in the 19th and 20th centuries, causing reactions against questioning the bible that we are still defending today. Some of this is mentioned but not adequately considered. 4)	There is no clarification that understanding history and belief in a certain theology is different. Most of the arguments made are cogent and understandable, but an unspoken assumption remains: if the favorable situation is allowable in historical terms (meaning our current versions of Christianity are and always were correct) it is assumed to be true. Jesus had to act in history or our beliefs are unfounded and useless. Even if we can show that Jesus doing certain things in history is the best answer, it doesn’t mean that our modern beliefs about him are correct. Though I do understand that this book is written by a believer for other believers, it remains an important historical point that should be very clear in a book that wants to address historical concerns. I am glad Lee Strobel wrote this book because I appreciated his willingness to ask these questions, which many Christians could find too large or taboo to consider. This book will help people feel more secure in their beliefs against current climates, criticisms, and invalid arguments made against our faith. I feel that this sort of willingness to ask questions is a necessary beginning for the Christianity of history to continue amid large skepticism and outright hostility toward any moral regulation. The answers about Jesus from our parent’s and grandparent’s generations do not seem to meet the needs of our current experience. I believe returning to the source is the only way to understand Jesus for our current needs and for the future, but I do not think that this book is the monumental or definitive work against historical criticism for which it will be mistaken. Thank you, Lee Strobel, for creating this very accessible opening into the historical conversation. Lee Strobel’s “The Case for the Real Jesus” provides a cursory look at few different challenges facing Christians today. The book mostly focuses on throwing cold water on arguments from academics and writers such as Elaine Pagels, Bart D Ehrman, and Tom Harpur, before moving onto the broader question of ‘Did Jesus fulfill the messianic prophecies’ and responding to trends against organized religion in exchange for personalized belief systems. If one was to believe the marketing hype, you’d expect Lee Strobel’s “The Case for the Real Jesus” provides a cursory look at few different challenges facing Christians today. The book mostly focuses on throwing cold water on arguments from academics and writers such as Elaine Pagels, Bart D Ehrman, and Tom Harpur, before moving onto the broader question of ‘Did Jesus fulfill the messianic prophecies’ and responding to trends against organized religion in exchange for personalized belief systems. If one was to believe the marketing hype, you’d expect Strobel to grapple with the challenges directly by interviewing the very thinkers he wants to discredit. Instead, Strobel takes the easy route by seeking out like-minded Evangelical Christians who spoon-feed him the positive answers he’s looking for. Unfortunately, the issues Strobel is trying to cover here are too many and too complex to discuss with any real depth within the limits of a book this size, although he does provide resources for suggested reading at the end of each chapter. That’s not to say the points presented aren’t persuasive, but the presentation is incredibly one-sided and often dismissive of opposing views; most definitely not the “hot light of scrutiny” we were promised. A very thorough investigation on Jesus Christ. A little long and deep, but very informative and persuasive. Listening to it every evening re-affirmed my Christian faith. Again Mr. Strobe makes an excellent case. The evidence is clear. The question remains, what will you do with this Jesus? Lee Strobel is the author of The Case series of books which include The Case for a Creator, The Case for Christ, and The Case for Faith. In this book, The Case for the Real Jesus, Strobel explores the newest objections to orthodox Christianity's Jesus, the Gospels, and church history. As he does in all of these books, he interviews key scholars in answering the objections of skeptics and liberal scholars which are really one and the same. I've read a couple of Strobel's books, the most compelling Lee Strobel is the author of The Case series of books which include The Case for a Creator, The Case for Christ, and The Case for Faith. In this book, The Case for the Real Jesus, Strobel explores the newest objections to orthodox Christianity's Jesus, the Gospels, and church history. As he does in all of these books, he interviews key scholars in answering the objections of skeptics and liberal scholars which are really one and the same. I've read a couple of Strobel's books, the most compelling to me being The Case for a Creator. But this is coming in at a close second. A real close second. Like on the heels. I appreciate the research that Strobel puts into these books. It shows a true care for the subject which he's pursuing. He's still old school, opting for traveling and having face to face discussions with these scholars in lieu of the Internet and the ability to interview via video chat. There are nuances in face-to-face interviewing that one can miss or are nonexistent in digital interviewing. In answering these challenges, Strobel went to prominent scholars, the most impressive and convincing being Craig A. Evans, Michael L. Brown, and Paul Copan. Like in all of these books, Lee plays the devil's advocate in these interviews, throwing objections and challenges at these scholars verbatim from those who presented them as well as his own through the flow of the discussion. Lee's writing is not just pedantic but you get the feel that you're actually sitting in and seeing the two have the discussion. During each interview, I Googled each scholar so I could have a face to put to the dialogue which helped in my enjoyment of the book. These books are faith builders. They help in answering some of the many skeptical assertions made against Christ and Christianity. They help Christians become more grounded in their faith while at the same time presenting the other side of the argument for those who have only heard one side. Whoa. To make that kind of dogmatic assertion today is the epitome of politically incorrect and yet, he backs up this claim with what I saw as bulletproof scholarship making the statement even more profound. I'm a Christian and it shook me. Yet, with all of this solid material, I got the sense that there was an over-reliance on logic and facts in place of Scripture. That there was not enough biblical correlation as the final authority. In other words, that the Scriptures were what the facts, logic, and scholarship backed up. Don't get me wrong. I'm all for facts and logic in reference to solid faith. Strongly. But that's not the final test of truth. And though Scripture came up quite a bit in the discussions, the book's conclusion gave the impression of more of a fact find than a truth find. Lee didn't bring it home with how all these facts directly related to the truth of Scripture. He saved that for the appendix and that, to me, is the biggest thumbs down for the book. I enjoyed reading this book. I am quite fond of Strobel's style, and his personality and bluntless bleeds through the pages and words. As a journalist who has an extensive background in law and expertise in investigation, seeking reliable sources, and gathering evidence, he has a compelling skill set that allows you to trust in his methods and his approach to embarking on his personal journey to bolster his case for the REAL Jesus. This book is in the same format as The Case for Christ, in that he I enjoyed reading this book. I am quite fond of Strobel's style, and his personality and bluntless bleeds through the pages and words. This book is in the same format as The Case for Christ, in that he has specific goals, specific topics to tackle, a systematic approach, and specifically chosen experts to answer his toughest questions. In this book, he sets out to tackle six of the biggest objections to the true identity of Jesus Christ as he is described in the New Testament. These are powerful objections in our post-modern day, and he understands that if even one of them goes through, the traditional picture of Jesus is compromised and a huge shadow of doubt falls upon the entire revolution that Jesus supposedly began. 2. The Bible's portrait of Jesus can't be trusted because the church tampered with the text. 6. People should be free to pick and choose what they believe about Jesus. It is easy to see that these are very strong claims that Strobel truly believed needed to be cleared if he was going to maintain confidence in his worldview as a Christian. Like The Case for Christ, Strobel chooses experts all over the nation to interview to discuss these claims one by one, bringing to them the objection in full force with multiple additional lines of reasoning related to them. I have to say that I was compelled by much of the evidence being presented by the scholars he chose to interview. They provided facts backed by evidence and sound reasoning. However, like my objection for his previous book, this book is highly biased toward the Christian worldview, as he seeks out only Christian scholars to address the issues. Again, this is fine, since the objections are aimed at Christians, and Strobel seeks out learned Christians to provide their defense. However, I do feel as though this book would be much more balanced and interesting if he interviewed atheist and agnostic skeptics as well, perhaps putting cases from both sides head to head to provide the reader with more opportunity to be challenged and apply a greater degree of critical thinking. I do like how Strobel includes study questions at the end of each chapter, as well as additional resources on each topic that he recommends people look into if they have more questions. One thing I did learn through reading this book that troubled me was that I realized how prevalent intentional deception in the scholarly world really is. I knew it was a real thing, but to know that scholars are deliberately twisting the facts and distorting the truth to intentionally mislead people to follow their own biases is quite upsetting. People can be hurt and broken by such deception and be turned away from their pursuit of the truth, and this is something that really angers me. Knowing this is making me have to be a lot more careful and critical myself when reading books and articles by people, including Christian authors, as well, even though everyone does have their own biases (I'm no exception). This book follows the same format that Strobel used in an earlier book "The Case for Christ." He frames issues and then interviews various experts to respond to the issues. The approach provides a quick, very readable overview of some rugged terrain in contemporary theology. The drawback is Strobel interviews only those experts he agrees with -- the more conservative or moderate voices in the seminaries and universities. We have no one from The Jesus Seminar or similar radical schools of thought This book follows the same format that Strobel used in an earlier book "The Case for Christ." He frames issues and then interviews various experts to respond to the issues. The approach provides a quick, very readable overview of some rugged terrain in contemporary theology. The drawback is Strobel interviews only those experts he agrees with -- the more conservative or moderate voices in the seminaries and universities. We have no one from The Jesus Seminar or similar radical schools of thought to defend their positions. So, ideally, this book should be read together with one or two books from the other side -- perhaps something by John Dominic Crossan or Robert Funk. A stylistic annoyance is Strobel's practice of listing detailed credentials as he introduces each of his six commentators. I guess the purpose is to make sure the reader understands that the conservatives have just as many degrees and publications as their opponents. But most of that detail could have been relegated to footnotes. This book is ideal for people who have waded through a lot of revisionist theology and wonder what's left. His experts present some convincing arguments that the four Gospels chosen by a bishop conclave centuries ago still have great value and are trustworthy. One of the sections I found most helpful was the review of Old Testament prophecies about a Messiah and how Jesus fits those prophecies very closely. Lee Strobel is quite a prolific author. Fortunately, he always has worthwhile things to say. Most folks are familiar with Strobel’s story…how as a reporter for the Chicago Tribune, he undertook a two-year investigation of the claims of Jesus, which led him to belief and salvation in 1981 (a story worth reading in his book “The Case For Christ”). Since then, he has written numerous other “A Case For…” books (Easter, Christmas, Faith, Creator...). Now, recent attacks on the claims of Christianity h Lee Strobel is quite a prolific author. Fortunately, he always has worthwhile things to say. Most folks are familiar with Strobel’s story…how as a reporter for the Chicago Tribune, he undertook a two-year investigation of the claims of Jesus, which led him to belief and salvation in 1981 (a story worth reading in his book “The Case For Christ”). Since then, he has written numerous other “A Case For…” books (Easter, Christmas, Faith, Creator...). Now, recent attacks on the claims of Christianity have led Strobel to revisit his original subject matter. Strobel interviews a who’s who of scholars on each point. The evidence and explanations are extremely detailed. Don’t be fooled, this is a tough read - but it’s worth the effort. I learned new things in each chapter, including some things that I had never heard before in a lifetime of following Christ. I found the chapters dealing with challenges #1 and #6 to be especially relevant. I’ve been in conversations with people about these very topics, and always felt too uninformed to give a proper response. This book has given me the tools I need to be able to engage in these conversations intelligently. It's interesting, but not 100% what I was hoping for: the facts the author presents are just as nebulous, in certain areas, to me as the falsehoods or accusations he's trying to disprove...I need more history with the information he's discussing--there's a presumption of familiarity of either side of the argument on Jesus--and the people he interviews appear credible, but I don't get a deep sense of why he's chosen these people in particular to interview--is it because of some seminal work? Beca It's interesting, but not 100% what I was hoping for: the facts the author presents are just as nebulous, in certain areas, to me as the falsehoods or accusations he's trying to disprove...I need more history with the information he's discussing--there's a presumption of familiarity of either side of the argument on Jesus--and the people he interviews appear credible, but I don't get a deep sense of why he's chosen these people in particular to interview--is it because of some seminal work? Because they're friends? Because only they were available when he called? This book is probably better for someone who has a greater historical sense and more biblical background than I do, but it is enjoyable otherwise. Strobel offers further reading at the end of each chapter, some of the books I might checkout at some point. And I agree with another reviewer that Strobel is arguing in a vacuum so there's no rebuttal from the opposition, though he does bring up points on behalf of the opposition in order to push against the truths the people he interviews believe in. With Strobel's investigative background I did expect a lot more information. I could've done without the aside information of him nodding to show he understands someone, or what they're wearing. But his writing is accessible and the tone is genial. But in some ways I think I'm more confused than when I began reading this book. In this book, author Lee Strobel sets out to discover who the real/historical Jesus was. In his first book, the Case for Christ, Strobel already "proved" that Christ existed and was the Son of God. Strobel's questions in this book center around whether the Gospels are accurate biographies of Jesus' life, whether the crucifixion and resurrection happened as described in the Bible, whether Jesus was the foretold messiah, and whether we can pick and choose what we want to believe about him. I found In this book, author Lee Strobel sets out to discover who the real/historical Jesus was. In his first book, the Case for Christ, Strobel already "proved" that Christ existed and was the Son of God. Strobel's questions in this book center around whether the Gospels are accurate biographies of Jesus' life, whether the crucifixion and resurrection happened as described in the Bible, whether Jesus was the foretold messiah, and whether we can pick and choose what we want to believe about him. These arguments are laid out in a manner that makes them easy to understand. Sometimes it seemed to boil down to one "expert's" belief vs another, but there is enough there that I made me re-think these books I had read. If you were to ask the average person “Who was Jesus Christ” you might be surprised at the answers. Some believe he was God, others the Son of God, still others believe he was only a teacher. Some don’t believe he ever existed. Of late, a lot of media attention has been directed to Jesus (the Mel Gibson film primarily comes to mind) and many wonder if the picture of Jesus painted by the gospel accounts is anywhere close to the truth. Journalist Lee Strobel investigates the claims currently being If you were to ask the average person “Who was Jesus Christ” you might be surprised at the answers. Some believe he was God, others the Son of God, still others believe he was only a teacher. Some don’t believe he ever existed. Of late, a lot of media attention has been directed to Jesus (the Mel Gibson film primarily comes to mind) and many wonder if the picture of Jesus painted by the gospel accounts is anywhere close to the truth. Journalist Lee Strobel investigates the claims currently being made about Jesus and his life. Are the alternative gospels (the gospels of Judas and Thomas, the document “Q”) really truthful, and did the early church suppress them? Were the biblical texts tampered with by the early church? Has the resurrection of Christ—the foundation of Christianity—been disproving by any current archaeological findings? Is the life of Jesus based on earlier mythological beliefs? Strobel uses the same format as in his other “The Case For…” books: he interviews experts in their respective fields and poses skeptical questions to them in order to get the answers. He also invites discussion and debate about the answers via a series of summary questions at the end of each chapter. He also includes additional recommendations at the end of each chapter for further reading. While I don’t always agree with the conclusions that Strobel or the experts reach, I find his books interesting reading. One of my favorite books that I have read this year. This writer is the same that wrote "The Case for Christ." He takes a journalistic, interview style approach coupled with scholarly, meticulous referencing of sources. Since the book is largely comprised of interviews, the book itself is easy and fun to read. The reader is treated with the back and forth and easy banter of dialog. Strobel writes in a way that the reader can get a sense of the interviewee's personality and appearance. Strobel add One of my favorite books that I have read this year. This writer is the same that wrote "The Case for Christ." He takes a journalistic, interview style approach coupled with scholarly, meticulous referencing of sources. Since the book is largely comprised of interviews, the book itself is easy and fun to read. The reader is treated with the back and forth and easy banter of dialog. Strobel writes in a way that the reader can get a sense of the interviewee's personality and appearance. 1. Other gospels present a different Jesus than the gospels in the Bible. 2. The Biblical Jesus is untrustworthy. 3. Whether Jesus resurrected from the dead. 4. Beliefs about Jesus were copied from pagan religions. 5. Jesus did not fulfill the messianic prophecies in the OT. 6. Cultural and moral relativism and Jesus. While the book is pretty fun to read for a book on Christian apologetics, it also levels thorough and scholarly criticism against critics of the Bible and its picture of Jesus. So, the reader has an easy reading style coupled with in-depth scholarly information put in laymen's terms. This was the first book by Lee Strobel that I have read. I would read a book by him again. His investigative reporter style of writing makes it easy to read. This book helped me understand what the average, non-churched (and to some extent the people in the pews) believe about Jesus if they listen to pop culture theologians. As I read this book, I could easily pick up many of the themes that we see on fictional television as well as the shows on History channel. My take away, there is a lot of s This was the first book by Lee Strobel that I have read. I would read a book by him again. His investigative reporter style of writing makes it easy to read. This book helped me understand what the average, non-churched (and to some extent the people in the pews) believe about Jesus if they listen to pop culture theologians. As I read this book, I could easily pick up many of the themes that we see on fictional television as well as the shows on History channel. My take away, there is a lot of speculation about the "Real Jesus" and many of these speculations are built around some amount of research. However, when confronted with the facts, it all falls apart and it can be proven that the gospels are historically accurate, early writings, about the real man, Jesus, who fulfilled every bit of Scripture just the way Scripture says He did. Even though I fully believe these things, I was impressed at the scholarship of these well respected men and wonder if I could come close to giving a rebuttal to these allegations. This gives me a desire to better know the Scriptures and be prepared to discuss some of these current attacks on the identity of Christ that is so prevalent in our culture and will surely come up in conversation. This is another volume in Lee Strobel's ever growing _The Case for ... _ series. Previously, I read and enjoyed his _The Case for Christ_. The weakness of the series is that there's no rebuttal from the other side. So you have the Christian scholar making a strong case for the Christian position while Lee Strobel plays the doubting skeptic. I think Lee accurately portrays the skeptical positions, but you don't have the other side's response in their own words. One audience for the book is Christ This is another volume in Lee Strobel's ever growing _The Case for ... _ series. Previously, I read and enjoyed his _The Case for Christ_. The weakness of the series is that there's no rebuttal from the other side. So you have the Christian scholar making a strong case for the Christian position while Lee Strobel plays the doubting skeptic. I think Lee accurately portrays the skeptical positions, but you don't have the other side's response in their own words. One audience for the book is Christians with an interest in apologetics, philosophy, historical Jesus studies, etc. Here I'm reminded of Josh McDowell's _Evidence that Demands a Verdict_ but this book is more fun to read. The other audience would be folks influenced by skeptics that call into question the identity of Christ. For example, I know someone whose faith has been challenged by Bart Ehrman's books and skeptical take on the Bible (e.g., Misquoting Jesus and Jesus Interrupted). So if you've read Ehrman, you can easily read this volume that does a good job in showing that Ehrman has overstated his case. There were several great gems in this latest "Case" by Lee Strobel - the refutation of the gospel of Thomas at the beginning, the snappy outline of how Christianity didn't copy from other ancient religions. Both keeper pieces. There were some eye-opening moments, like the Jesus tradition being a "community effort, not an isolated account running private from one person to the next. Or how James was Jesus' brother: "If I had a brother who was perfect... I'd hate him!" The Arabic method of determin There were several great gems in this latest "Case" by Lee Strobel - the refutation of the gospel of Thomas at the beginning, the snappy outline of how Christianity didn't copy from other ancient religions. Both keeper pieces. There were some eye-opening moments, like the Jesus tradition being a "community effort, not an isolated account running private from one person to the next. Or how James was Jesus' brother: "If I had a brother who was perfect... I'd hate him!" The Arabic method of determining inspiration via the beauty of the piece was shockingly subjective, though more ridiculous was the one relativist who actually believed the world was flat when people believed that way. Unfortunately, some of the interviewed scholars resorted to some level of emotionalism and a sense of my-word-versus-the-skeptic's sort of debate. That should have been amended, even if the chapters must go longer to hold solid evidence. Strobel should have dug deeper.